The Crafty Cattery: Pretzel Day! I've been craving a soft pretzel for weeks now! I've always been too afraid to attempt making them myself - having to "use yeast" and "boil dough" seemed intimidating. But last night we caught a pretzel episode of Throwdown with Bobby Flay on the Food Network and it really didn't look all that scary. I hunted down a recipe online (from the illustrious Alton Brown, no less) and made my attempt. It wasn't as hard as I thought! Using yeast was easy (just a lot of waiting, basically) and boiling the dough wasn't any more difficult that boiling pasta. Unfortunately we couldn't find any pretzel salt to go on top so we used table salt which didn't taste quite right. I also wish that I had made them thinner so they wouldn't be as doughy in the middle. Anyway, they tasted pretty good for a first attempt and I also got to use the stand mixer I received for Christmas. Win-win! 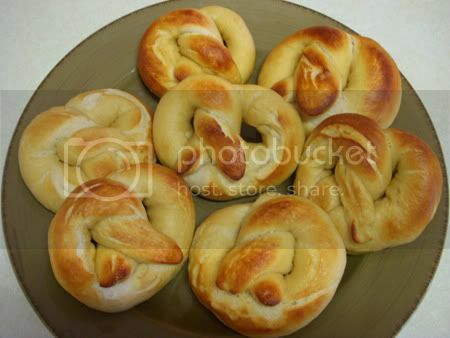 I know, I've been dying to make them again - I just can't find any pretzel salt! You can buy it online at www.alisonspantry.com - and they also carry pretzel dough mix. Thanks for the site, Kelly, I've been looking for somewhere to buy pretzel salt!